There have been numerous claims to a relationship with the legendary King Arthur (of the Round Table), surrounded now in more myth and legend than established fact, so recording a few more possibilities adds more mystery and intertest than any true scholarship. However, I have tried to summarise the historical background of the Arthurian legend, but the topic is so vaste this can only be a glimpse at best. Gwenwynwyn of The Scots See Discussion1. King Cadwaladr (two discussed). See Discussion2. Caradog Vreichvras (Fraichfras), King of of Gwent See Discussion3. When the Roman armies invaded Briton, they easily defeated the native tribesmen, but despite defeats in pitched battles, the people of mountainous Wales and Scotland were not as easily conquered and their scattered settlements remained "the frontier-lands". The fierce resistance of the tribes in Cambria meant that two out of the three Roman legions in Britain were stationed on the Welsh borders. The Red Dragon, one of the most ancient badges in the world, was brought to Britain by the Romans, who had copied it from the Parthians. Following the departure of Roman legions (to face a threat to Italy by the Goths), the newly weakened state of Britain came under increasing threat of invasion by the Saxons from Denmark. The next six hundred years saw battles and rivalry between the forces of the Celts (with the Red Dragon symbol, as on the Welsh flag) and the Saxons (with the White Dragon). Around these two warring forces grew the legends of Merlin and King Arthur, probably a Romano-British tribal chieftain or warlord who helped unite the brave but comparatively disorganized Celts of Cornwall, Wales, Northumbria and possibly the Scottish lowlands sometime in the 5th - 6th century. According to Geoffrey of Monmouth's "History of the Kings of Britain" (c.1100 BC-689 AD) , there was Vortigern, Vortimer, Aurelius Ambrosius [b c433-38 d in the 480s], second son of Constantine, his brother Uther Pendragon then Uther's son Arthur (? died 542). These names are familiar to any reader of Mary Stewart's "The Crystal Cave", "The Hollow Hills" and "The Last Enchantment". Another school of thought has the legendary King Arthur based on Prince Arthur of Argyll (Prince of Scotland) b.559, d.603 who married Gwenhwyfar De Bretagne (Guinevere of Brittany, daughter of Leo de Grance). See Prince Arthur. [a] "Concerning the Ruin of Britain", ("De Excidio Britanniæ") by the Northern British monk, St.Gildas, in the mid-6th century. [b] The Welsh Easter Annals or Annales Cambiæ, supposedly written over the years that they cover, AD 447 to 957 (very early entries probably written some time after the events), This document records historical events alongside many of its yearly entries. [c] "History of the Britons" by the Welsh historian Nennius, ?a monk from Bangor Fawr (Gwynedd) in the 8th century. Nennius used numerous chronicles to put together this compilation history of the British peoples. The work is particularly noted for its chapter concerning the Campaigns of Arthur, telling of his twelve battles. The Ruin and Conquest of Britain 400 A.D. - 600 A.D: A Summary of Gilda's Account c545:  In 400 A.D. most of Britain (the part south of Hadrian's wall) had been part of the Roman Empire for over three and a half centuries, and all free-born Britons had been Roman citizens for half that time. Christianity was well established and the cities remained relatively prosperous, if somewhat less so than in the past. In the preceding half century there had been a number of worrying raids by barbarians: the Picts from north of the Antonine wall, the Scots from Ireland and the Saxons, which was the generic term used in the Roman world for the north-western Germanic tribes including Angles, Jutes and Fresians as well as Saxons. The Roman general Magnus Maximus had largely countered the Pictish threat by enlisting the British tribes between the Hadrianic and Antonine walls as federate allies of the Empire. However, he subsequently withdrew most of the Roman troops in his failed bid to usurp the Imperium from 383 to 388.
c.425 Vortigern comes to power as the head of a council of Britain. Dies in a fire in 447.
c.449 Vortigern (possibly Britu,using the title "Vortigern = Overlord see Overlord) invites Jute/Fresian mercenaries under Hengest, and settles them in Thanet, to use in punitive raids against the Picts, and possibly also to counter the threats of British rivals and Imperial invasion. c.456 Vortigern's son Vortimer takes power and repudiates his father's agreement with Hengest. He invades Kent but is defeated by Hengest at Crayford and driven back to London. ?471 Vortigern takes power again, and invites Hengest and his army back. ?472 In a meeting with the council of Britain, Hengest's men murder all 300 British elders by surprise, and ransom Vortigern for Essex and Sussex. Vortigern hands over power to Ambrosius Aurelianus. c.460-72 Ambrosius Aurelianus of pro-Roman faction takes full control of Britain; leads Britons in years of back-and-forth fighting with Saxons. British strategy seems to have been to allow Saxon landings and to then contain them there. c.465-70 'King' Arthur probably born around this time. c.466-73 Period of minimal Saxon activity. Re-fortification of ancient hillforts. 473 Men of Kent, under Hengest, move westward, driving Britons back before them "as one flees fire." c.475 Ambrosius Aurelianus rallies the Britons and defeats the English (Angles & Saxons). Fortunes of war fluctuate until 518. His "brother" Uther Pendragon, takes over when Ambrosius is poisoned. He is, according to the medieval historian Geoffrey of Monmouth, the father of King Arthur. There is no proof that Uther Pendragon really existed, though scholars believe he may have lived sometime during the mid-late 400s. Some think he was Enniaun Girt, son of Cunorix (Kenneth) of the Votadini (from Edinburgh). To the ancient Welsh and Britons the fearsome dragon became known as the 'Pendragon', the chief dragon, a symbol of national pride and of war  This was then the name given to 'Uther, High King of Britain'. This name was the title of Kings, and therefore given to 'Arthur' upon the death of Uther, the 'dux bellorum', 'the leader in war'. 477 Saxon chieftain, Aelle, lands on Sussex coast with his sons. Britons engage him upon landing but his superior force besieges them at Pevensey and drives them into the Weald. Over next nine years, Saxon coastal holdings gradually expand in Sussex. c.485-96 Period of Arthur's "twelve battles" during which he gains reputation for invincibility. c.495 Arthur takes over from Ambrosius as Dux Bellorum (battle-leader) of the Britons. He is victorious over the English in Lindsey, the Picts (presumably) in Caledonia and the Irish (presumably) in Carleon. The Germanic King Cerdic and his son, Cynric, land somewhere on the south coast, probably near the Hampshire-Dorset border. They establish the beginnings of the Kingdom of Wessex. King Gwynllyw of Gwynllwg carries off Princess Gwladys of Brycheiniog. War between the two kingdoms narrowly avoided by the intercession of the legendary Arthur. The couple marry. c.496 The Siege of Mount Badon. Britons, under the command of the "war leader" Arthur, defeat the Saxons, under King Esla of Bernicia and possibly Cerdic of Wessex. 518 Battle of Badon (Bath) -according to Gildas- in which Arthur defeats the English. Aelle (probably the English leader) and Cerdic die. Britain is partitioned by treaty between the British and the English. Gildas is born. c.496-550 Following the victory at Mt. Badon, the Saxon advance is halted with the invaders returning to their own enclaves, many (in the 530s) Saxons migrate back to Germany. A generation of peace ensues. Corruption, civil turmoil, public forgetfulness and apathy further erode Romano-British culture over next fifty years, making Britain ripe for final Saxon "picking." c.500-17 King Cadwallon Lawhir (?brother of Cadwalladr,) expels the Irish from Anglesey. 508 King Cerdic of Wessex begins to move inland and defeats British king, Nudd-Lludd (Natanleod), at the Battle of Netley. 517 Death of King Cadwallon Lawhir of Gwynedd. His son, Maelgwn takes the throne, murders his uncle, probably King Owain Danwyn (Ddantgwyn) of Rhos (claimed as Arthur by Phillips & Keatman ) and Mick Baker , and re-unites the two kingdoms. 517-49 King Maelgwn flourishes in Gwynedd. Invades Dyfed & tries to assert himself as High-King of Britain. 537 The Strife of Camlann", according to Annales Cambriae. Fought between the forces of Arthur and Mordred (Medraut). Death (or unspecified other demise) of Arthur (according to Geoffrey of Monmouth). 545 Gildas writes "The Ruin of Britain". 633 The British, under King Cadwallon of Gwynedd, meet the Northumbrians in the Battle of Hatfield Chase. King Edwin of Deira is killed in the fighting and Cadwallon is victorious. Cadwallon is later besieged at York by Edwin's cousin and successor, Osric. The former is again victorious. 634 King Cadwallon of Gwynedd slays both Kings Eanfrith of Bernicia and Osric of Deira rather than negotiate peace with them. Eanfrith's half-brother, Oswald succeeds to a united Northumbria. He gathers a force and clashes with King Cadwallon of Gwynedd at the Battle of Heavenfield. Cadwallon is killed and Oswald victorious. 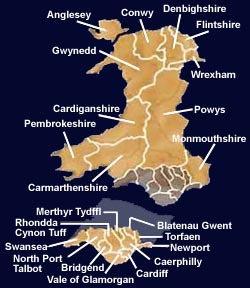 Cadafael Cadomedd usurps the Gwynedd throne and ousts Prince Cadwaladr. Civil War ensues in the kingdom. 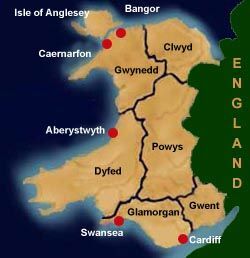 688 King Cadwaladr Fendigaid of Gwynedd dies on a pilgrimage to Rome. So how is Gwenwynwyn of The Scots [(b~565, ~575), wife of Cynan Garwyn (White Shanks), (~545-610), King of Powys (r~570-d.610) = the Blayney link]  related toPrince Arthur of Argyll (Prince of Scotland)? That Prince Arthur of Argyll (Prince of Scotland) (559-603) was the father of Gwenwynwyn of The Scots (b~565). At present I cannot locate the source of this claim, so it could even be a tranlocation error (copy and paste) on my part!!. and Gwenhwyvar, daughter of Ogyrvan Gawr (Gogfran the Giant). So, other than the son Mordred (by his half-sister Morgawse in some stories, while others -including Geoffrey have him as his nephew), various stories and histories have Anir, Amhar, Llacheu, Gwydre, Loholt, Ilinot, and Borre as sons of Arthur, so there is plenty of room for a daughter who had Blayney descendants! That Gwenwynwyn of The Scots was the daughter of King Gabrain mac Domangart (Domangairt) of the Scots and his first wife Ingenach of the Scots. King Gabrain mac Domangart's second marriage was to Queen Lleian which produced King Aedan (Mac Gabhram) who married High Queen Ygerna Del Acqs (a.k.a. Igrain) and they had eight children including Arthur (Artuir). [24a] This would make Gwenwynwyn an aunt of Arthur. However, most genealogies record Gwenwynwyn of The Scots as the daughter of Prince Domangart mac Aedàn of the Scots (b~559-596/603) [24b], although not all have Domangart as a son of Aedàn. Prince Domangart's parents were Aedàn (Aidan, Aeden) mac Gabràn "the Treacherous", King of Dalriada (b.525/33 r574-604/8) and Ygerna (Igrain) ferch Amlawdd of Wales [or Domelch verch M�lgwn of Gwynedd]. Aedàn's sons included Eochaid Find (b~560-590/6), Artúr (Arthur or Arturius) (559-603), Domangart (b~559-603) and Eochaid Buide (608-630) who survived to inherit the kingship, also Tuthal (Tuathal), Bran, Baith�ne, Conaing, and Gartnait. Aedàn appeared to have had 2 or three marriages, which I cn't seem to find any consesus about. Aedàn's parents were Gabran (Gabhran) of Argyll Mac Domangart (~500 - ~560) (King of Dalriada & Scots) and Lleian (Lluan, Ingenach) b~526 (a.k.a. Ingrain), daughter of Prince Brychan II and gt-grand daughter of Vortigern. This claim makes Gwenwynwyn the niece of Arthur. If not the daughter, Gwenwynwyn of The Scots could have been the niece or the aunt of the historical figure of Artur (Prince Arthur) of Argyll. The main objection to this Arthur being THE King Arthur is that both Arthur and his brother Eochaid Find (The Fair) were killed at the Battle of Circin in 598 while their father King Aedan of Dalriada was still reigning (he abdicated his throne in favour of his son, Eochaid Buide about 606 and dies 609). . Furthermore, the historical Arthur died after the Battle of battle of Camlan (537/9), before Prince Arthur was born! The well researched book "Arturius - A Quest For Camelot" by David F Carroll  gives fairly convincing support for placing Arthur and most of his battles further north and later in the 6th century. Nothing is known of King Meirchion Meirionydd's son, Cadwaladr, but he was a contemporary of King Arthur, living in the late 5th century. August Hunt and , theorizes that the two are identical since Cadwaladr means "Battle-Leader," a name possibly rendered into Latin as the title used for Arthur by Nennius, Dux Bellorum. According to August Hunt, this Cadwaladr has the right name, is at the right place and at the right time. He was not familiar with any other candidate for Arthur who fulfills these three conditions. I have nothing to link this Cadwaladr to the Blayneys. See The Kings of Meirionydd. St. Cadwaladr Fendigaid, King of Gwynedd (c.630-664) son of Cadwallon was never a contender as the true King Arthur (born 114 years after Baden Hill and 93 years after the generally accepted death of Arthur), but he was "twenty-sith in line from Joseph of Arimathea"  and was considered the last Pendragon. It would be over 800 years before the Welsh would re-take the throne of Britain when in 1485 the Red Dragon of Cadwaladr was carried by Henry Tudor in his defeat of Richard III in 1485. See St. Cadwaladr Fendigaid to get a fuller discription and see his descent to the Blayneys. So many contradicting theories made difficult by all the myth and legend will likely continue to cloud the true historical Authur. Blayney connections could well be present, (whichever theory proves the most accurate) through the Kings of Powys. Gwynedd is now a County in NW Wales, and Meirionydd is an electorate (Meirionydd Nant Conwy) district (Merionethshire) or a pre 1974 county (Merioneth). Gardner, Laurence "Bloodline of the Holy Grail: The Hidden Lineage of Jesus revealed" [Arthurian Descent pg 358, Arthur and the House of Avallon Delacqs pg 361 & Bloodline of the Holy Grail pg 365.] Penguin 2001 ISBN 0 14 100615 3. Chadwick, Nora. 1953. "The Lost Literature of Celtic Scotland: Caw of Pritdin and Arthur of Britain." Scottish Gaelic Studies 7:115�183. Our Family History - My Lines: Me, my ancestors, and my relations Robert Brian Stewart Evans, GA.